Seaside Pondicherry, with its pervasive French heritage, is a place that's best leisurely experienced. Stroll through the streets of the French Quarter and along the Promenade, sit in the cafes, browse through the boutiques, and soak up the ambiance. While taking in the sights, don't overlook these cultural things to do in Pondicherry. There are many thriving local industries to discover! You can also stay in at heritage property near the beach and take a day trip to the experiential spiritual community of Auroville near Pondicherry. The best way to get acquainted with Pondicherry is to get up early and take The Wake Up Pondy Cycle Tour, offered through Sita Cultural Center. It covers various areas including the interesting old houses of the Muslim quarter, Goubert Market and flower market, Kuruchikuppam fishermen's village, and Beach Road. You'll get to hear insightful stories about the town that you won't find in travel guides! The tour is quite relaxed, with plenty of stops on the way. It departs from the Sita office at 6.45 a.m. and concludes at 9 a.m. with breakfast. Pondicherry was the largest French colony in India until 1954, when French rule ended. However, their legacy lives on in the French Quarter where the architecture, food and language have all been preserved. It can be quite a culture shock, as it certainly feels more like France than India there. The French Quarter is ideally seen on foot, so grab a map from your hotel and start walking! If you'd prefer to go on a guided walking tour, there are a few options. StoryTrails conducts a 2-hour French Connections Trail that covers the heritage of the district, including landmarks such as the Notre Dame de Anges (Church of Our Lady of Angels) and Government House (formerly the palace of the French governor). The Aurobindo Ashram & Pondicherry French Quarter walking tour offered by The Blue Yonder also traces the journey of Sri Aurobindo. Pondicherry has a dual identity, distinctly divided by the French Quarter and Tamil Quarter on the other side of the canal. The contrasting architecture and culture of the Tamil Quarter is more in line with India. The neighborhood is home to many migrants from surrounding states who came to Pondicherry to follow the teachings of Sri Aurobindo. StoryTrails will take you through it on their Food Trail guided walking tour, while introducing you to some of their favorite foods and entertaining you with tales of life there. The tour operates daily from 4.30 p.m. to 7.30 p.m.
Manakula Vinayagar Temple, dedicated to Lord Ganesh, was built before the French occupied Pondicherry in the 17th century. The temple survived attempts by French missionaries to demolish it and is a popular pilgrimage destination for Hindus. However, it's most famous for its resident elephant. She blesses visitors who donate a coin by touching them on the head with her trunk. The temple is open from 5.45 a.m. to 12.30 p.m. and 4 p.m. to 9.30 p.m. Its golden chariot, vibrant paintings, and numerous stone carvings of Lord Ganesh in various forms are highlights inside. Unfortunately, photography is only allowed in certain areas. If you enjoy cooking, don't pass up the opportunity to learn some exotic new dishes to impress your friends and family. Sita Cultural Center holds both French and Indian cooking classes. Various options are available, including vegetarian. You'll be able to learn a fully French menu, from starters to dessert, with ingredients available in the Indian market. The Indian cooking classes encompass Tamil, Bengali and north Indian cuisine. These classes start with a market tour to enable participants to become familiar with the spices used. The French cooking classes are held on demand for more than two students, while the Indian cooking classes take place on Wednesdays and Fridays from 10 a.m. to 1 p.m. as well as on demand. Alternatively, if you'd like to cook in an Indian home and eat with a family, check out the lessons offered by Shyama's Kitchen. Prefer to eat rather than cook? Pondicherry has some fine restaurants that are housed in heritage properties. They're really atmospheric. One of the best is Chez Francis at Hotel de L’Orient on Rue Romain Rolland. It specializes in Pondicherry Creole cuisine, which combines local Tamil spices with French ingredients, and gourmet French cuisine. Villa Shanti on Rue Suffren is perhaps the most popular place to eat in Pondicherry. It's really pretty at night when its courtyard is lit up by candles. Both Indian and European fare are served. The Courtyard restaurant at Le Dupleix hotel, the former residence of the French governor-general Joseph Francois Dupleix on Rue De La Caserne, offers fusion "Pondicherry cuisine". 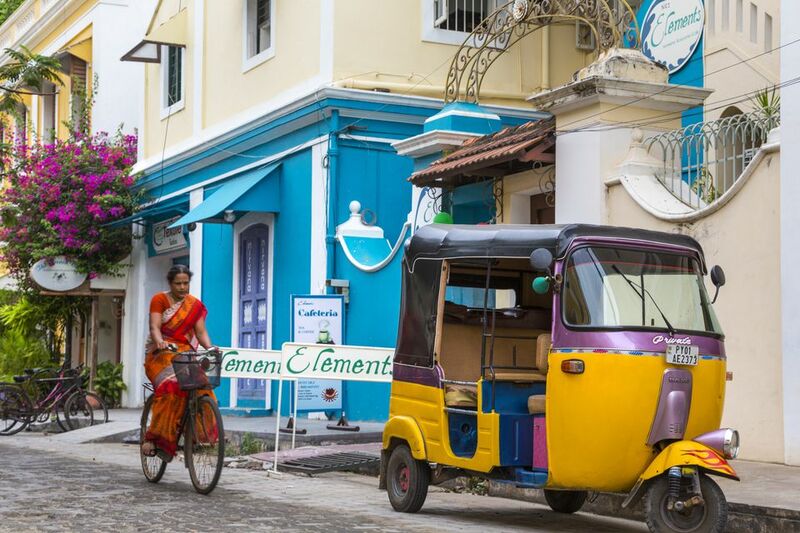 Pondicherry has a thriving art scene, which the French contributed to. Bohemian Artika Cafe Gallery is in an old French house on Rue Labourdonnais and will appeal to those who like quirky art and fashion (there's also a boutique on the premises). You could easily spend a few hours relaxing there with light bites, juices and coffee available. Popular Kalinka Art Gallery on Rue Bazar Saint-Laurent showcases contemporary works from Indian and international artists. It has a really knowledgeable owner. Tasmai Center for Art & Culture in Kuruchikuppam provides a platform for contemporary visual art, including sculptures, featuring local artists. It's a gallery, studio and home of the owner who's an artist-sculptor. Events such as workshops and talks often take place there. For a unique experience, you can even stay in an art gallery in Pondicherry. Aurodhan Heritage Guest House occupies the top two floors of Aurodhan art gallery on Rue Francois Martin and has seven air-conditioned double rooms (all decorated with art of course!). Kolam-making is another activity offered by Sita Cultural Center. This eye-catching form of decoration is drawn on doorsteps and entrances to homes, and is particularly prevalent during festivals (such as Pongal) in south India. It looks amazing but a certain technique is required to do it. The classes run for 90 minutes, and take place daily at 10 a.m. and 3 p.m. The serene grounds and 18th century mansion of the Cluny Embroidery Center are an attraction themselves. However, the dainty high-quality French-Colonial embroidery produced by the women at the center is quite irresistible. This renowned institution is run by Roman Catholic nuns to provide employment and income for under-privileged women. Items available for purchase include cushion covers, bed linen, handkerchiefs, tablecloths, napkins and tea towels. Cluny Embroidery Center is located at 46 Rue Romain Rolland, opposite Hotel de L’Orient. It's open from 9 a.m. to noon and 2 p.m. to 5 p.m., daily except Sundays and Mondays (closed). You'll get eco-friendly stationery with a difference, as well as gorgeous notebooks, wrapping paper, craft paper, gift bags, and even paper lanterns at Sri Aurobindo's Handmade Paper Factory. Silk screen printing adds to the intricacy. The prices are extremely reasonable too! This fascinating factory, situated on S.V. Patel Salai, was set up in 1959 as a unit of Sri Aurobindo Ashram. It's spread over several leafy acres, and it's possible to take a tour of it. The factory is open Monday to Saturday from 9.30 a.m. to 11.30 a.m. and 2.00 p.m. to 4.30 p.m. The showroom is open from 9.00 a.m. to 5.30 p.m., Monday to Saturday. On Sunday, it's open from 10 a.m. to 1 p.m.
Love handicrafts? Auroville has many enterprises that provide local employment and produce a wide range of items including incense, clothing, tableware, jewelry and home furnishings. To find out more about how they're keeping art alive and to see the artisans in action, join this Auroville Art and Craft Trail offered by Wandertrails. You'll be guided through some of the craft centers by an Auroville resident and told about the community. If you wish, you can even have a go at making something.